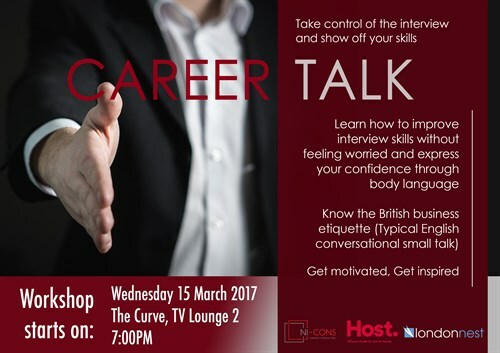 Remember our Career Talks at The Curve? Last week Carla and Laura from Ni-Cons Consulting explained us the importance of having a LinkedIn profile. Here you can find little summary. LinkedIn is the equivalent of Facebook, but for professional purposes. It is defined as a business and employment-oriented social network targeting professionals. Essentially it’s your online CV. Through LinkedIn you can list your work experience, your education history, your achievements and awards. It’s a longer version of your resume, complete with links and photos. Indeed, much more engaging than a black on white paper story of yourself. LinkedIn is the right social media for you whether you are a CEO of a big company, the owner of a small business, a recent graduate or still a student looking for career opportunities and to expand your network of professional connections. As for Facebook, you connect to other professionals by adding them to your Network, with the same option to accept or ignore the request. You can post on your homepage, tag other users, send and receive private messages. Rather than share your daily activities with your friends, you use LinkedIn to show your achievements and performances, as well as using it to give advice sharing your experience (e.g how to cope with a difficult client or how to use effectively negotiation skills). To create an account is easy, make sure you use a proper email address to be shown on your profile, and a nice yet professional photo of yourself. In few lines describe who you are, keep a formal style and never forget that your profile might be your ‘passepartout’ for your future employment. Something that in the UK has an important value is your volunteering experience, anything that shows that you care about a specific cause and you are not just a career focused individual. You can be a chef, a lawyer, you can provide cleaning services or translations, LinkedIn is the social media perfect for you. If your profile is complete and nicely written you will have more chances to be noticed without actively looking for a job. You never know what opportunities you may find round the corner! Don’t forget about the next Career Talk. Find more details on Facebook.